The Eighth Judicial District Commission on Judicial Performance unanimously recommends that Judge Julie Kunce Field BE RETAINED. 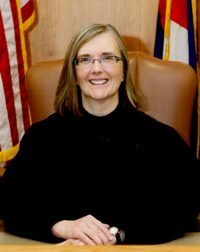 Judge Field was appointed to the District Court on January 11, 2011. Before her appointment, Judge Field served as a mediator and a national trainer on family law, litigation, and mediation issues. Judge Field also served as a law professor and law clinic director at the University of Michigan, Washburn Law School and the University of Denver College of Law. Before her teaching career, Judge Field was in private practice with the law firm Nutter, McClennen and Fish in Boston, Massachusetts. Judge Field is involved in a number of law-related community service tasks, including organizing the training and scheduling of the local “Our Courts” program.